See the full power of our revenue maximization capability using your actual site, keywords and Google Analytics data. Our demo will give you actionable results. Revvim delivers actionable SEO content alignments that are designed to maximize your site’s organic search traffic and revenue from search engines. Typically, SEO analysis requires hours of auditing, data mashing and Excel manipulation. Revvim automates these grueling analyses and produces the exact actions necessary to make the greatest possible SEO impact. With Revvim your staff will spend its time focused on generating results rather than reports. 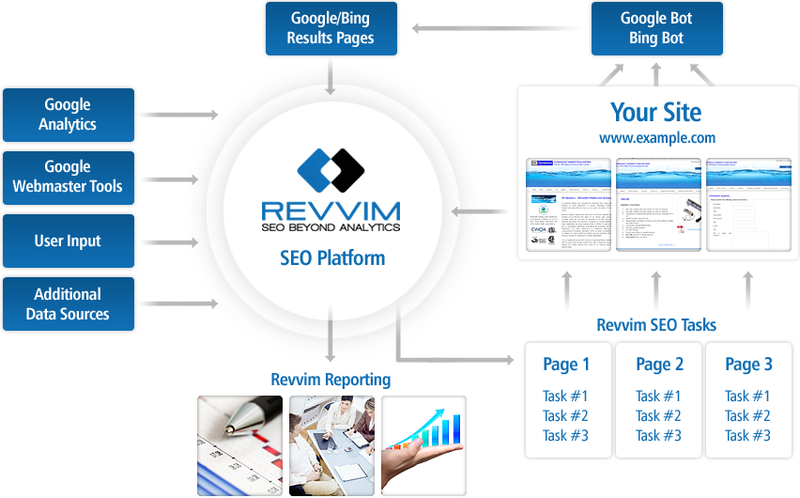 The Revvim SEO Platform receives input from a multitude of sources including Google and Bing SERPs (Search Engine Result Pages), Google Analytics, Google WebMaster Tools, user input and other sources. Data from all of these sources are processed using Revvim’s patented algorithms to formulate a keyword to page(s) mapping for all of your keywords. This mapping takes into account a number of variables including search volume, revenue, visits and other metrics to automatically determine which keywords are the most valuable to SEO for each page on your site. Revvim then identifies how to best optimize each page of your site for the specifically mapped keywords. The output is a prioritized list of specific actions that are ready to be implemented. These alignments are very easy to understand. No special technical expertise is required, just follow the explicit directions as shown below. Add “black leather” to the <TITLE/> tag to optimize for “black leather shoes”. Add “Gucci Watch” to the <H1/> tag to optimize for “Gucci Watch”. Add “polkadot” to the URL to optimize for “polkadot bow ties”. Apply a 301 redirect from current URL to new URL. Each week Revvim automatically reviews your site and delivers a fresh set of SEO content alignments. This constant monitoring ensures that any updates or content changes are rapidly optimized for organic traffic with an action items list for your new keywords and pages. Of course, Revvim also monitors any changes in rankings and modifies it’s content alignments to make sure you’re always in the best position to capitalize on organic traffic and revenue.